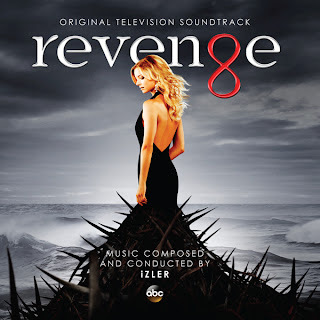 For two seasons, iZLER – a Czech-born, English-raised composer and multi-instrumentalist – has made Revenge into a musically-driven show that Variety described as containing "smoky, elaborate film noir-inspired compositions." One of the distinctive characteristics of iZLER's score for this compelling series is his use of themes performed by a 50-piece orchestra. Both are becoming a rarity in television, but thanks to the foresight of ABC Studios and an understanding of the impact of acoustic music, iZLER's music elevates the show to a higher emotional level. As iZLER comments in the liner notes, "Although orchestra samples have really gotten pretty good these days, they will never be able to replicate the emotion of that one great performance from real, world class musicians. The unquantifiable final touch that real musicians add to a score is what transforms it from simply an idea into emotion, that at its best, can truly elevate whatever you’re watching unfold on screen." For this release, iZLER has compiled music from both Season One and Season Two to deliver a knock-out album that musically brings the show to life...even if you're not watching it. In Revenge, beneath the luxurious lifestyle of the Hamptons, lies a dark, dirty secret and a twisted tale of passion, suspense, and ultimate redemption. Wealth, beauty, and power define the residents of New York's most exclusive community, but one woman will stop at nothing to exact revenge from those who ruined her father's life. Witness Emily Thorne's (Emily VanCamp) brilliantly vindictive plot against Victoria Grayson (Madeleine Stowe), the reigning queen of the Hamptons, and all who destroyed her family. However, even the best-laid plans can unravel in the wake of an unexpected love triangle between Emily, the son of her greatest nemesis, and a forgotten face from her past. This album is timed with the release of Season Two on DVD and Blu-Ray. For more details click here. And don't miss season three of Revenge, which premieres on Sunday, Sept 29th at 9/8c on ABC.